Part of Blockbuster Express’ recent deal with Fox is that a few new releases from the studio will be exempt from the new 28-day window and will be available the day they are released on DVD—albeit for a higher price. 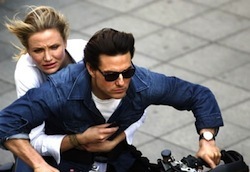 The first such title will be the Tom Cruise/Cameron Diaz action movie Knight and Day, which will be released on November 30. BB Express pricing on the title hasn’t been revealed yet, but speculation places it at possibly $3 for the first night and $2 thereafter. How would you feel about paying $3 at a rental kiosk for the privilege of renting a forgettable-at-best Tom Cruise movie the day it’s released, Insiders? Also, what do you think “the near future” means to Coinstar/Redbox? this movie needs blu-ray so … you decide how to do it. bb express can charge any price they want. no bluray means no sale. What makes this deal any different than walking into a video store and paying $3 or $4 for it? All it means is their movies are going to sit, unrented, in their kiosks. The whole idea behind $1 rentals is that people are tired of paying $3 or $4 for a movie. What a bunch of morons! If I want any movie day and date, I just go into a brick-and-mortar Blockbuster and get it for $1.99 plus tax thanks to being a BB By Mail subscriber. There’s no way in hell i’m paying any more than $2 (Minus tax) for ANY movie. $3 at a kiosk? Are they out of their friggin’ minds? What about those who don’t want to venture to and from a brick and mortar Blockbuster? I don’t want to start the car up just to go to Blockbuster and back, I had better already be doing some grocery shopping close to my nearest Blockbuster. Can you return in-store exchanged movies by mail or must one return to the brick & mortar Blockbuster to return said movies? ??? !!!! Some people just don’t get it !!! A dollar movie is better than a $2 or $3 movie. I will just wait for the 28 days. No sweatyda!!! Choke fana !!! Mula me my home K6 !!! Pooty Rooty? You speaking in tongues? No, just GI Turkish and Korean. I have just been to too many countries (23) since I have been in the US Air Force and I really hate to travel. I should have stayed a civilian. Oh well thats crumbled cookies! Ah well then, you get a free pass. Thank you for your continued service! I can wait until Redbox / Netflix has it. People who did not go to the theater to see a movie are not likely to pay extra or buy it just to see the movie 30 days earlier. Redbox has plenty of other titles for only $1. Tom who? LOL. Wouldn’t rent it anywhere for any price. I am lucky to have a “dollar” theater about 15 minutes south of my location. That alone beats down 28 day restrictions. Only current problem is Theater #7 screen/projection is messed up, therefore watching The Expendables was kinda nasty since the left and right sides of the projection were cutoff. $1.50 matinee, $2.00 after 6pm, $1 Tuesday nights after 6pm. Winner.